“I believe Jason Meyer deserves to be recognized as an INS Superior Student for several reasons. Jason is a junior at Olin High School. 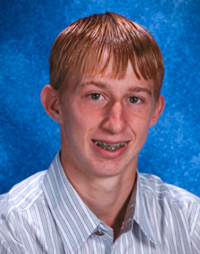 Jason is a superior student in academics as well as community involvement, drama, church, sports and music. Jason demonstrates excellence in all he does. Jason is from a single parent home and you could not ask for a more dependable, polite and giving young man to be a part of our future. Jason has been involved with Boy Scouts of America for many years. Jason has also been involved with the Youth Group at the United Methodist Church and has been involved with several out of state mission trips to help those in need. Jason, as well as his family, has been involved with the holiday church plays for the surrounding communities. This brings the true spirit of the holidays alive. When the flood devastated our town, Jason and his entire family were the first to volunteer to fill sandbags and save other homes from the water. Jason worked tirelessly for many hours non-stop. Jason also unanimously gave half of his birthday money to the local food pantry to help others in need. How many high school students would do this? Jason is on his school’s football, basketball and baseball teams. Jason has participated in Drama, Band and Choir and is on the honor roll. Jason is also involved with Student Council and is active in Red Ribbon week and LRP. Jason is currently taking Kirkwood classes along with his regular academic classes. Jason is aspires to become a plastic surgeon to help those with severe disfigurements. Jason and his family put on an annual Halloween Haunted House for the children of the community. This allows the children to be safe and have some fun. Jason puts in many hours and lots of work to set up, participate and tear down within twenty-four hours.